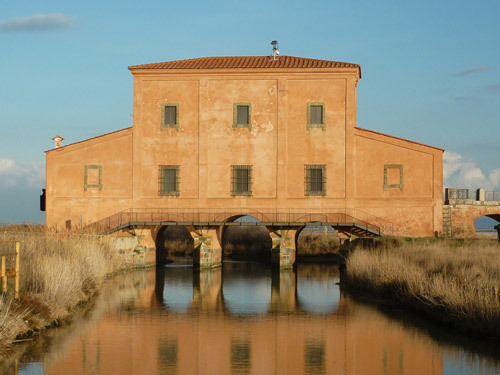 Casa Ximenes, also called Casa Rossa - the Red House - is one of Maremma's most photographed buildings and the starting point for wildlife photographers trips out with their lenses. It can be found a short distance from the historic centre of the pretty and popular port and town of Castiglione della Pescaia and is a symbol and marks for most visitors the beginning of a trip into "La Diaccia Botrona", the Riserva Naturale Provinciale Diaccia Botrona (the provincial nature reserve of the Diaccia Botrona). But as close as it is - within walking distance - to Castiglione della Pescaia, most of the towns many weekend visitors (it is bustling most Saturdays and especially Sundays with Italians taking a "due passi") and summer holiday makers (the combination of the many bars and restaurants, boat moorings and long wide shallow golden sandy beaches make this one of the most popular summer holiday destinations along Maremma's Silver Coast) do not make the short trip to Casa Rossa. But if you are visiting Castiglione della Pescaia, you should. It will leave you with a completely different experience from the town and a deeper understanding of what it is that makes Maremma so very very special. For even the walk to the house takes you into one of the worlds most important marshlands. As one of the youngsters in our party said to one of the guides, "it's not red, its orange!". And, of course, she was right and they agreed. But Casa Ximenes is widely known nonetheless as Casa Rossa, the Red House. It is publicised as a multi-media museum, but be aware that it is a very small one: it won't keep your little ones amused for more than twenty minutes or so. But as part of the visit there is a mini cinema housed at the end of the building, with a very professional film and light show that I highly recommend. The film is in Italian (there are no English sub-titles), and apart from one short section, because of its slow pace and excellent visual presentation it is possible with just a little Italian under your belt to grasp the history that it unfolds of the ancient "lago di Prile" (Prile lake) upon which much of the reserve is sited, its importance for the two major Etruscan city settlements at Vetulonia and Roselle, and the drainage of the marshland. The film lasts for about ten minutes (if your children can sit still that long!). If when you are there you wonder what the large video camera on the very top of the building is for, it is one of three very high powered cameras for monitoring the wildlife and reserve - for example the recent introduction of a false eagle nest that has attracted a resident male now seeking a female - rather than you! 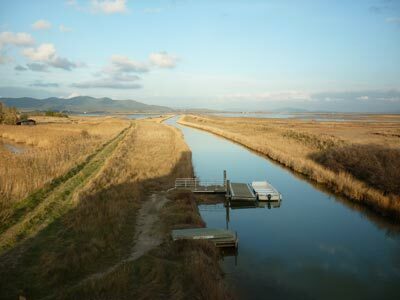 The other two are located on the Isola di Clodia and within the marsh reeds. The images are shown in the top floor of the building, enabling you to follow the activities of the marshland in real time. In the sixteenth century, the lake of Castiglione stretched for some fifty square kilometres and was one of the most extensive in Tuscany. 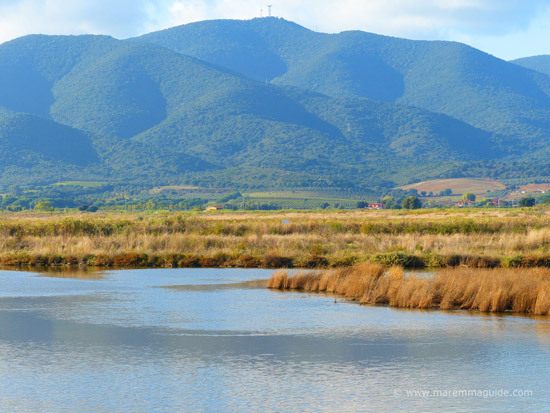 Much of the lowlands of Maremma were inhabitable boggy marshes rife with malaria and the average life expectancy for those living in or near them was twenty-two years. 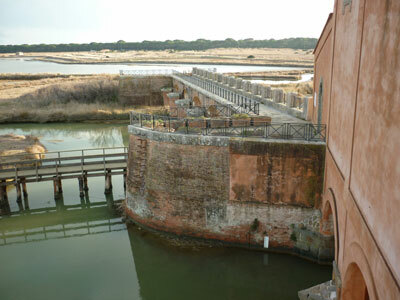 Three centuries later under the rule of Pietro Leopoldo di Lorena (Leopold, the Duke of Lorraine) a systematic framework for the reclamation of la Maremma, including the vast plain of Grosseto, was initiated. The Duke commissioned a Jesuit mathematician by the name of Leonardo Ximenes to study and plan the necessary interventions to drain the lands and eradicate the malaria. Leonardo Ximenes believed that it was the miasma from the stagnant marshes that caused malaria and that preventing the mixing of freshwater with saltwater would stop it forming. 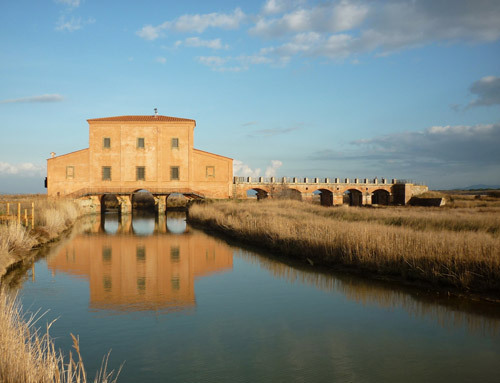 And so the "La Fabbrica delle Cateratte" (The Sluice Plant) called Casa Rossa, was built between 1767 and 1768 as the main tool for the rehabilitation of the marshes of Castiglione and to keep the river and sea waters separate. The building, which rests on three arches, has been completely restored and the machinery for operating the sluices now forms part of the museum. What you can see in the car park! On both of my recent visits to Casa Ximenes I have had the pleasure of "meeting" this lovely and rather robust "gentleman" who goes by the name of Nutria or Coypu. His ancestors aren't native to Italy, but were introduced as captive animals from South America and bred for their fur, which then lost its value. Those that escaped into the wild have enjoyed life here ever since! As well as guided treks through the reserve, it is possible to book boat trips - any day of the week - through the marsh. The trips last for two hours and will take you to a couple of bird-watching locations up towards the Isola di Clodia, where you disembark. Note: a minimum of five people need to have booked a trip for the boat to depart. If there is no wind, or if it is favourable to carry your scent away, I have it on good authority (the guides!) that it isn't uncommon to spot wild boar swimming from one side of the canal to the other. You can see their many exits and entrances as well as their mud baths in the reeds as you make the trip. Open from Thursday to Sunday from 14:30 to 17:30. Closed Monday, Tuesday and Wednesday. The entrance fee to the building and museum is Euro 3,50, with a reduced fee of Euro 2,50 for groups of more than 10 people, children under the age of 12 years, or adults over the age of 65 years of age. The boat trips costs Euros 12,00, with a reduced fee of Euro 10,00 for groups of more than ten people, and Euro 6,00 for children under twelve and adults over the age of 65 years of age. The boat ticket includes the cost of the entrance fee to Casa Rossa Ximenes. If you are in the area during February then for one weekend - in 2012 it was Saturday 18 and Sunday 19 February - entrance to the Casa Ximenes and the boat trips are free. During this weekend, the boat trips are for one hour duration rather than the usual two as they are an introductory "taster" to encourage you to visit again, but well worth it. We had a fabulous time. Our little one asked to go again so we did! And on our first trip out in the "palude" (marsh) we were lucky to see over a hundred pink flamingos take flight and encircle us twice before landing to feed again (a small light aircraft had disturbed them). Spectacular. The winter months are the best time to see not only the pink flamingoes, but all of the wide diversity of bird life. Many birds are resident all year round (including the flamingo) - so there are always many to see - but their numbers are much increased during their migratory winter-over here. 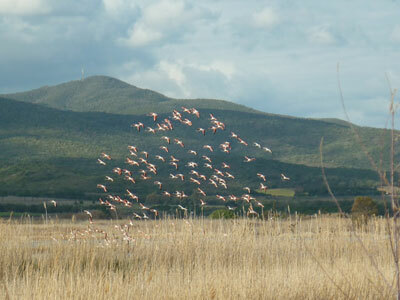 In 2011, the reserve did a count of the number of each species of bird and, for example, the pink flamingos now number around 1,300 in the winter, with about 300 birds remaining throughout the year. For more information about the bird species that you can spot during the year here: birdwatching in Maremma. There are also a couple of wooden picnic benches in the grounds. There is a toilet inside (immaculately kept I have to say - probably because the guides are women!). The inside of Casa Ximenes is, however, only accessible by a flight of iron stairs and inside the building the floor levels change. 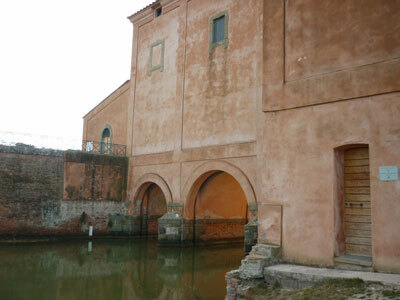 Visiting Casa Ximenes would make for a great walk along the Fiume Bruna (River Bruna) and canal to reach it from Castiglione della Pescaia. In the winter you probably won't spot another car along this road, but in the summer it is busy with boats mooring, the owners cars and holiday makers seeking parking near the beach. Find out more about the wildlife reserve and its incredible bio diversity before you take your walk or boat trip: the Riserva Naturale Diaccia Botrona.